I’d like you all to leave here today knowing that I love you and that Liane loves you. And that sometimes that love is all we have and sometimes it is all that matters. I'm not sure how to do this. How can I try and describe someone so special in plain old words? And, how can I possibly sum up the feelings and memories I have for Liane in one tribute? It’s almost impossible. There are words of happiness about the treasured time we all had with Liane, albeit too brief. There are words of beauty to describe her individuality and how she always looked. There are words of sorrow to try and communicate what we are feeling now she has left us. For me Liane was a fiery spark full of love and determination. She was beautiful, smart, challenging, empathetic and encouraging. She always looked to grow; to better herself as a person and a professional. She was aware and spiritual - vipassna with her dad and brother – mindfulness course finished the night she passed, yoga and recently facing her fitness fears with boot camp. Liane Deasy was from a certain mould of woman like so many of you sitting and standing here in front of me. She was like both our mothers, our sisters, our sisters in law, and many of our friends - a strong, positive and certain woman. No inch given but a powerful respect and warmth in every encounter. She was the powerful type of woman that we see challenging our society today and I deeply loved that about her. Her seizures often resulted in a loss of consciousness especially one of the magnitude of last week, so you can all take solace from the fact that her death was a painless and fast one. We debated going to Sydney together but she decided not to go. She was committed to a new job and more importantly she wanted us to go away together and spend precious holiday time alone. All 31 days. We liked that we could let each other breathe and remain independent in our relationship despite committing our lives to one another. We'd booked a yoga retreat in Italy for July and were counting down the weeks to relaxing together. We were looking at beach holidays and a getaway for next year’s midterm. The future held so many plans – maybe a family, definitely more sea swimming and as much travel as possible. All that will be different now, but I feel she’ll be with me wherever I go. We first met in Galway at a fancy dress party back in late 2007 - she was the pretty blonde girl from Adelaide Road I'd never spoken to. We got on famously from the start despite being so different - I found her so intriguing and was stunned that somebody so pretty was laughing with me and enjoying my company. She liked my then long hair, my outgoing personality and my eyes. We were in full-blown hippy mode back then – all ideals and passion and living in a city that nurtured that in both of us. A few months later and we were inseparable, building our love out west on the streets of Salthill, the long piers of Galway and in the warm embraces of a new relationship. After college in UL, she moved to Dublin for me - a bold and brave decision - and worked so hard to make it all work - volunteering, working multiple jobs, slowly building her reputation as a SLT of a gentle nature and passionate professionalism. She was so proud of her work - often telling me of mothers, fathers and children who felt she'd performed miracles with them. She had such passion for the people she worked with and for many of whom are here today. This passion brought about success and her young career was already one of note in Irish Speech Therapy circles. We moved in together and shared so many adventures – camping in Sardinia, hitch-hiking the coast of Portugal, exploring Sydney with friends and family, Airbnb-ing across as Ireland, sauna-ing our way through Finland and many more. I’m so scared of losing all those memories. I worry that as time passes my mind will shed those precious gifts. But I know that even if it does, she’s in a part of me that nobody can ever touch. There’s a Panzer shaped compartment in my heart that will hold her ‘til the day I die. I love you and will always love you. I endeavor to listen to you and hear you, to support and respect you, to laugh and have fun with you and to continue to appreciate you in new and different ways; as we grow older; as each of us meets challenges, periods of growth, change and good times. I will actively work to continue to grow in awareness of myself as a person in order to help me to do this. Today and for all our days together. I promise to be here for you for every step of our journey ahead, through the thick and through the thin. I want to grow with you and support you, to enjoy you and comfort you. I promise to be honest, to be forgiving and to be aware of what you need as our relationship changes. I hope to be a parent with you and nurture children into our loving world. Most importantly I promise to live in truth with you, with an open heart and with courage to explore fearlessly together. I love you and will always love you. Liane was a private person who valued intimate friendships over anything else. She was at her most comfortable in small groups where you could talk about important things as opposed to busy pubs and small talk. She forged such tight bonds with many of you and I'd like to thank you all for being there for her throughout thick and thin. She valued you all so much. She always wanted to spend more time with you all, especially recently when life seems to be busier than ever before. Above everyone else came her family. The Deasy clan and the Cornwall family, and over the past decade the Earleys too. She loved every relative so deeply and without question. Her wise and loving brother Alan and his amazing wife Onnie, her sister/best friend and partner in crime Jane. Her mum and dad with whom she had such strong bonds. She loved you both more than anything and was so thankful for all you gave her. And more recently Derry’s lovely partner Sarah and the newest Mark on the scene, Jane’s fella. She’s mad about you both. She doted on two godchildren – her best nephew Cillian and her ever so special Rowan, Julie’s daughter. I guess her loss is my gain. I’ll do my very best to care for you both in the way she did, not to mention keeping your young minds well fed with all the latest children’s books! · My best friend & my soul mate and the future mother of my children. We always spoke of what an amazing mother she'd be. And often wondered if our jobs’ skill sets were purposefully given to us so we'd raise an autistic or special needs child; a risk of the drugs Liane took for her epilepsy. Regardless of that she'd have loved children more than life itself. We'd been “practicing” … - the very start of a what we thought would be a long journey together. We'd even started to agree on some names but life had a different plan. · She was the perfect fit for me on so many levels but physically - sometimes I see people hold each other and they just fit. Like two pieces of a jigsaw. That was us. · We giddily agreed recently to get matching tattoos. I’d a nickname for her - Panzer Tank - strong, stubborn, dangerous… and I’ll be following through on my side of the bargain. I’ll keep you all posted. · She made me so happy all of the time and as recently as last Monday told me that life without me just wasn't as fun. Well, same back at you Panzer. All that said, we were lucky, I am lucky. We had something special that a lot of people never have. I've memories I'll carry with me for my whole life from swimming in Vico to chasing monkeys in Sri Lanka. From our matching orange bikes in Galway to our gentle pillow talk. - No hassles! The thought of a fuss being made would embarrass and annoy her in equal measure. - A spiritual recognition - maybe she's watching over us all. Maybe we will see her in another life. Maybe she isn't and we won't, but she always liked to think there was more than just our life on earth and she’s certainly convinced this cynic. - She'd want that we protect each other, talk to each other and share our grief - be open and care for those hurting. - And most of all she’d want that we try and be positive. I feel so so lucky to have shared just over 9 years with Liane. She's made me a better person. She's left an indelible mark on our lives and we need to honour that with strength and with love. As a friend said this week – we all need to be a little more Liane. - Robert and his staff at Fanagans Funeral Home. They’ve made everything so easy for us and their kindness will be long remembered. - Philip, our celebrant. We’d seen a number of weddings celebrated by Philip and Liane liked his delivery and personality. He’s be amazing with our family and we really appreciate that. - Liane’s medical teams in St. James’ Hospital – in particular Dr Doherty, and in Beaumount and way back at the start in Crumlin. - All of Liane’s many work colleagues who inspired and supported her so very well. She was mad about you. - All of our friends and family for the pure love and support we have received. It has been so important to us at this tough time. So I’d like you all to leave here today knowing that I love you and that Liane loves you. And that sometimes that love is all we have and sometimes it is all that matters. Tomorrow is Liane’s anniversary; April 20th - a date forever carved into the minds and hearts of so many people in my life. The build up to the date has been steady, a sort of low churn in my stomach, gradually ebbing and flowing. Some days have been worse than others, some days I haven’t felt the pull of it. I am feeling it now. How can it be that she is gone for 24 months? How much has she missed? How much have those around her missed? The time feels like so long and equally so short. So much has happened and yet it seems so recent that we mourned her for the first time. I often wonder what she would think of who I am now, of how I have changed and of what I am doing. Would she approve? Would she be happy for me? When I ask these questions I try to be truthful to myself and to her memory. I think she would be happy. I think she would want for me to continue to grow. I also think she’d want me to slow down and go easier on myself. So as the next hurdle arrives tomorrow I approach it cautiously and full of fear. At this close stage to it, I just want to be passed it. And that feeling brings with it of guilt, confusion and yet more sadness. In early February of 2016 Liane and her sister decided to book us all (including their dad) into a Beginners Beekeeping course in Dun Laoghaire. It was a two hour course that took place once a week on a Tuesday evening and we tried to eat together before or after. I was a little cynical going into it, not sure if I had the time or energy to give it and pretty certain that keeping bees wasn’t in our short or mid-term future as a couple. But the course provider, the Deasy energy and the bees won me over. I was fascinated. There’s a history of beekeeping in Liane’s family about which I know quite little. What I do know is that Liane’s grandad Dan Deasy was a central figure in Irish Beekeeping - head of the national association and an authority on the skill. His passion filtered down generation to generation and has somehow crept through to me. Liane’s family were reared around it and there are stories upon stories about the famous grandad’s beekeeping. There’s still honey from his hives in my press today. I have two hives at the moment. One is full of bees that I bought this spring and the other is full of a swarm that took over the hive at some point last summer before I started looking after it. The newer hive is called the Deasy hive and the older the Cusack hive (after a colleague who has helped me into beekeeping). To find the right date for the first line of this piece I went to Whatsapp and dug up the old group we had. The last thing on the group is an automated message “Panzer Left” from January 3rd 2018. I scrolled upwards and her personality, her words, her charm and mischief sprang out of the phone to meet me. I cried softly. I smiled at some of the memories that came to me. There is solace in the bees - the simplicity of the activity itself, the beauty of their hierarchy and method, the connection to nature and (sort of like competitive sport/sea swimming for me) the inability to let other thoughts cloud my mind. It’s a wonderful escape and one I feel will become a lifelong joy. As part of the PR for the Vitamin Sea program on RTE on April 1st I went on the Eoghan McDermott show on 2FM. It was my second time on a radio talk show, having been on The Ryan Tubridy Show earlier this year. It was a different experience. Eoghan is a friendly and more edgy character than Ryan. He made me at ease and still asked some difficult questions. I wasn’t as prepared as I had been for the Tubridy show having had a busy weekend and my mind and body were tired. But I’m happy with how Liane’s story comes across. You can listen to the segment below. Back in early December of 2017 I got an email through the Contact Form of this website from a woman called Shauna in the RTE Documentary Department. She was looking to talk to me about being in a documentary about the power of the sea in people’s every day life. She had read that I was swimming daily and about how much it meant to me. We met, got on easily and the planning began. Yesterday the documentary aired on RTE at 9:30pm on a Monday evening. My phone buzzed incessantly as people tuned in to see me talk about Liane, her death and my new reliance on the cold water therapy of the sea. Watching myself on the screen was equal parts challenging and strange. Lots of questions stirred. How different was I then to now? Did I do her memory justice? What would her family think? What would the other people in the documentary think? If Liane could watch it, what would she make of it? It unsettled me for the week. I felt the grief come pouring back in. I had many conversations both online and face-to-face that were hard and tiring. I hurt anew. As a piece of TV I found the show beautiful. The way it was shot, the way the stories were handled and edited. The footage and the people. So many brave souls and kind souls. It was an honour to have Liane and myself sit in amongst such a lovely group. It made me proud. And it made me sad. I miss her dearly. I often get the feeling that telling people about Liane and the way I tell people about Liane is inherently flawed. I find myself using the same words, the same expressions and the same intonation. It’s like a strange autopilot that gives me simplicity (and maybe protection?) and offers the person I’m talking to the opportunities to interject appropriately. It seems like I’m involved in some sort of societal dance, the rhythm of which I’m still learning and the aim of which I am unsure. Sometimes when the same phrases come out I feel a sense of detachment and that’s hard. I wonder if my heart is in it or if I’m on cruise control. Is it that the person I’m talking to won’t get it? Is it that my guard is up? Am I sick of it all? All these difficult questions rattle around my brain as I search for new ways to talk about the love I have lost and the life that was taken away. My brain overthinks. My heart suffers. As part of their efforts to raise awareness around SUDEP Epilepsy Ireland put me in touch with The Journal (www.thejournal.ie) and I wrote a piece about Liane, about her death and about my experience of it. You can read the whole piece here: https://www.thejournal.ie/readme/epilepsy-grief-sudep-mark-earley-4298659-Oct2018/ and an extract below. Being here without her has been – and still is – hard work. I’ve been saved by friends and family and assisted by professional help. I’ve dug deep and searched for positives, trying to live a life that celebrates everything she stood for. I think I’ve achieved a lot in terms of personal growth, who I have become and what I have shared with others. Each one of us will experience death or personal loss at some point so for me it seems logical to share my path to try to offer reassurance and hope to others. Through fundraising for Epilepsy Ireland, swimming in the sea on a daily basis and supported by the love of those around me, I have made it this far. I intend to keep going with Liane in my heart and my heart on my sleeve. 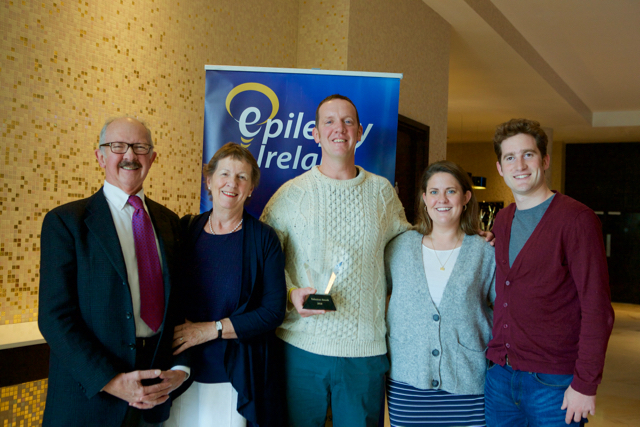 On Saturday September 29th I was presented with an award by Epilepsy Ireland as one of the Volunteers of the Year at their AGM in Dublin. It was an exceptionally proud moment for me and one that meant a lot. To channel my grief into positive action with the aim of honouring Liane and helping others was a goal from early on after Liane died. To have that publicly acknowledged was a nice touch from Epilepsy Ireland and a welcome/unexpected bonus for me and those around me. I wish Liane was here with me to see this. To see the effect of her death in a tangible positive sense. To see that after death there remains hope and love. To see who I am and how I’ve got to where I am. I wish she was here. Over the weekend I lost my wedding ring on a kayaking trip off Bowen Island near Vancouver. I took it off to apply sunscreen, ironically worried that getting cream on it might make it fall off my finger. I carefully put it on the kayak and promptly got distracted in the pre-launch packing up rush. I noticed 20mins into a windy and wavy 45min channel crossing that the ring was gone and burst into tears. Hard tears. Painful tears. Lonely tears. We designed our wedding rings and Liane’s engagement ring together with the help of a very close friend, Kate. They are simple and beautiful, the process another part of our wedding and marriage that meant a great deal to us both. I loved my ring - a palladium band - and all its character. Recently it had taken a few scrapes and dents as I rarely took it off and these little signs of wear and tear made me smile when I played with it’s uneven surface. I found solace in touching it, drawing strength and love from an immediately tangible source. I cherished the ring for so long, arguably my most valued possession and losing it hurt me deeply. I’m angry at myself for bringing the ring kayaking. I thought about leaving it behind with my wallet and my bag but wanted it with me. I’m angry at myself for the stupid manner in which I lost it - I managed to hold onto my phone and my watch and they mean so much less. I’m disappointed I didn’t have a say in the where and the how of not having my ring any more. I’ve thought about throwing it into the sea, quite often in fact, seeing it as sacrificing something for Liane, maybe at a place she loved. I wanted to frame it with her rings, but not until I was ready. When it felt right. On the other hand there’s something poetic and touching about losing it in the sea on a kayaking trip. She’d shake her head and laugh disapprovingly, reassuring me that we could replace it. Consoling me with a hug, a gentle touch, a sparkle in her eyes and maybe a reminder about not getting too attached to things... And at the end of the day the ring in itself was just that - an object. What it represented is a powerful and central part of who I am, what I had and who I want to be. The small strip of metal was a visible and cherished reminder but I have other items, photos, stories and memories that mean a lot too. Maybe there’s a certain symbolism in losing it in nature after seeing a small robin on a rock nearby. Or maybe it means nothing at all. I miss having the ring on my finger. There’s an empty space there and my fingers go looking for it often. The hurt is still raw but much like many other pains I’ll get through it and might even grow from it. As usual, time willbear witness to that. Tonight I sat at a bar bathed in sunlight and absent-mindedly watched the barman prepare oysters. I finished a book called “All the light we cannot see”, a book I started in May 2017. A book that Liane advised me to read. This post isn’t about that book but if you get the chance, and are strong enough, it’s a stunning if heart-wrenching read. As I sat here a couple next to me celebrated the lady’s birthday. I’d guess they are about 50 years old, maybe she’s a little younger. They’re happy, and are glowing with that relaxed holiday feeling, their evening stretched out ahead of them. That was meant to be us - sitting at a bar on the far side of the world celebrating our love. Sharing moments. Painting new memories. Growing ever closer. That was meant to be us. Well, Panzer – what would you think if you could see me now? That’s a question my therapist has asked me nearly every session I’ve had with her, especially over the last four or five visits. “And, what do you think Liane would say to that?” or “What would Liane say to you if she were here in the room with us?”. Invariably I told her that you’d be telling me to go easy on myself and to slow down, to be more present and less busy. I’m in Canada at the moment. I’m travelling over here for two months – a month on each coast and a few frisbee tournaments for good measure. I think you’d love where I’ve been so far – the gentle and kind people, the outdoors buzz and the amount of time I’ve spent sitting still – reading, thinking, being. I even found a nice chai latte spot. I arrived into Quebec tonight after flight delays and sleep deprivation. I’m sitting here in the dark writing my thoughts out to try and steady my mind and maybe get to sleep. A wave of melancholy washed over me quite suddenly tonight and it's been really hard to shake off. I still find it weird travelling without you. Nearly 14 months on and the way we were so used to going places together is as fresh in my mind as ever. I feel like a tandem missing a wheel. It was all so sudden Pannie – so final. No last adventure or chance to tick one of the places off our list. I don’t know if I’ll ever get used to airports again. I’ll either read this in the morning and delete the whole thing or just throw it up on the website warts and all. It’s so hard to know any more. I was so certain of so much and now its seas of doubt and loneliness. For the first two months of this summer I am going to Canada. Some of it with be spent with friends, some of it alone and some of it playing Ultimate with strangers and friends alike. I've never been to Canada before and I've heard great things - the buzz of Montreal, the Irishness of Newfoundland, the outdoors life of Vancouver and much more. I'm excited and I'm nervous. I've never set off anywhere alone before, certainly not for longer than a few days or a week. I'm starting on the east coast up in the north east of St. John's and then to Quebec, Montreal, Ottawa and Toronto. It's daunting and it's refreshing. I'm keen to be physically away for a while but I'm worried about the severing of the chord to the support network. From Toronto it's to Seattle to play a tournament I've wanted to play since I was in college and then up to Vancouver for a few weeks in July - the tough few weeks - birthdays and an anniversary. Second time around - harder? The same? I guess I'll see soon. Whatever the dates bring, I've made sure I'm in good hands up there. After that it's to Winnipeg for the World Masters Club Championships with the Sydney boys. I'm expecting a tough week or hard battles on the field and a lot of catching up with close friends off it. It'll be a perfect way to round out July and start into August. I've debated in my head about whether or not to write about the trip here on the There Are Words site. I've decided not to - at least not like a travel blog. This site is about grief, growth and Liane. I want it to stay that way as opposed to branching off in other directions. I'm certain the time alone will bring up lots of valuable writing and I look forward to the headspace and time to get a chance to share that. "The idea is simple - to promote the personal values/strength that Liane's love and kindness helped to build in me. She gave me confidence, self belief and inner strength. She taught me to be self aware and to back myself in situations I wasn't ready for. Liane's belief in me got me through tough times. I'd like people to wear the band, to pin it up to their wall, to give it to someone else or to put it away somewhere safe but to always remember that you have inner strength and your belief in yourself has got you so very far already. " Since then they have had a redesign and I've given another 1500 away. The bands now have an oak leaf and wave on them, representing her link to nature, our swimming, her strength, the oak as her favourite tree and a tree under which she is buried. I've mostly given them to frisbee players after games. In our sport the two teams come together in a circle and share thoughts on the game just ended. After these circles finish I talk to the other team about Liane, about the bands and about her (and my) story. Most of these talks are special moments full of emotion and human connection. Every single time I finish speaking I look into the eyes of friends/strangers and see compassion and love. It is beautiful and it is heart wrenching. The next largest group of recipients have been the students in Gonzaga College where I teach. Most recently the graduating class of 2018 each received a band and I spoke to them about what lies ahead. It was a moving and memorable experience for me, and hopefully for them too. If I can help just one or two of them in a tough moment it will be special. The thought that somehow Liane and the memory of her can give solace to a stranger, a friend, a family member, a student and more is something I'm really happy about. I often talk about the Liane Ripple Effect - how much good her death has brought into this world. Through all the pain, the loss, the sheer lack of sense comes this positivity and compassion. She'd love it. She'd absolutely love it (although ideally without any attention given to her!). For the first time since Liane died I missed one of the monthly anniversaries this month. On May 20th - a Sunday - I was in Berlin at a frisbee tournament, playing and drinking in the sun. I spoke of her, thought of her and felt her at times in some of the connections I made that day. But, I didn't think of her anniversary - not until the Monday when it hit me like a cold dagger. It is such a strange concept - guilt from not remembering the 13th month of your soulmate leaving your life. I mean, am I meant to mark every month? Am I not meant to? Where's the balance? Should I forget? Is that possibly some sort of strange progress? Today, not for the first time, my thoughts drifted to what role Liane would have played in the current debate about the Referendum tomorrow. I know where she’d stand on it but my heart warmed at the thought of how much work she’d put into sharing that opinion. Liane had a strength of character like few people I know. Her opinions were rooted in experience, learning and logic. She soaked up other people’s views and loved developing her world view from them, over languid cups of tea or a stolen half hour in a smoking area. She’d come back to me with all sorts of stories, eager to share them, a beautiful enthusiasm behind her eyes. Today it was an image of her - dressed with a small badge maybe, knocking on doors, entering people’s homes equipped with her openness and strong will - that made me smile to myself. It made me think of how much the referendum would have meant for and to her. It made me well up as a cast my vote. I hope we get the result the country needs - the result that says that the country supports the women living in it. I really do. The Corner Note is a small restaurant in Dalkey village run by locals. Myself and Liane spent many a Saturday and Sunday morning there - enough to know the owners, to order for one another and to grow comfortable in the place. It was a little haven for us - the right amount of chatter, silence and atmosphere. On Sunday morning I returned there for the first time since early April 2017 - a time when life was simpler and happier. As I pulled up on my bike my eyes welled up and heart skipped a few beats - it constantly surprises me just how much emotion places have attached to them. I spoke to the owner, who I hadn't seen since Liane's death. We shared anecdotes, tears and a gentle understanding. I ordered the same order I always got. My words caught in my throat and I sat there - upset anew. "I'll be back and next time I'll bring friends" I said as I turned away from the memories and the generous owner. She's refused to let me pay for my meal - another small gesture, like so many before it, that make me believe in our race more than ever before. I unlocked my bike and cycled away slowly wondering how many more "first times" lie ahead but also happy, glad I'd faced another place. Another brick for the wall. The slow rebuild continues. "She'd be so proud of you". "If Liane could see what you've done..."
"You must be so happy to have honoured this way"
So often there are turns of phrase delivered gently and kindly that ring hollow. They echo in my mind, drift into my heart and pinch at the strings in there, gnawing away below the surface like an underwater current. There's a sort of constant uneasiness - a dark discomfort that I can't shake or soothe. The truth is I don't want Liane to be proud of me from afar. I don't want to sit and look back at what I have achieved since my soulmate died. I don't feel suddenly better from growing without her. I want to hold her hand. I want to whisper in her ear and see her face react to the words. I want her to look me in the eyes and see the spark of belonging that I felt for her and from her. I need her to be by my side and to advise me on what to do, carefully unpacking my messy thoughts as they tumble out onto her lap. I want to touch the soles of my feet against hers just before we fall asleep. I want to pick up the phone and send her my inane daydreams. I want to plan holidays for the two of us instead of seeing my friends travel the world in pairs. I wish she was here. It's that simple.